In a move that feels a long time coming this season on Lucifer, ‘Orange is the New Maze’ focuses on everyone’s favourite prickly demon, who is feeling desperately sad – and a sad Maze (Lesley-Ann Brandt) is an angry Maze. Having stormed out of Chloe’s (Lauren German) place last episode, and upset Trixie (Scarlett Estevez), Maze is seen on security camera footage with her hand around the handle of a knife that’s firmly wedged into a murder victim’s chest. 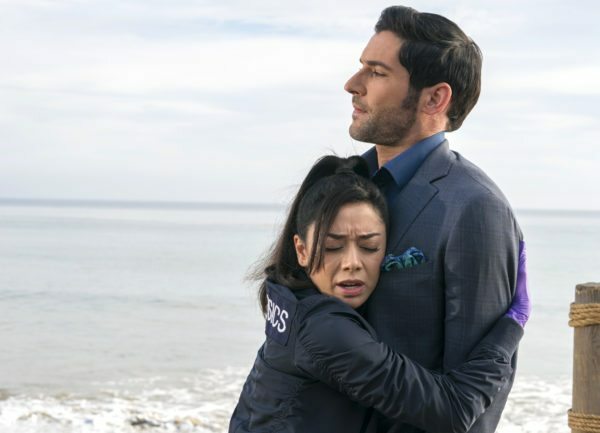 This damning evidence, however, seems suspicious to Lucifer (Tom Ellis), Chloe and Ella (Aimee Garcia) – despite Maze’s current behaviour and willingness to take responsibility for the crime – and so they begin to investigate. This episode’s California-ness is represented by an upmarket winery, which is where the deceased worked as a picker. 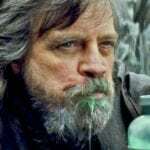 After interviewing key employees there, the team decide to bring in Maze’s ex-bounties on the reasonable assumption that one of them may hold a grudge against her – it turns out, however, that she is remarkably popular amongst them, having given one guy a beer after inflicting permanent damage to his torso, and having scared another one straight. Alarmed and confused by Amenadiel’s (D.B. Woodside) accidental revelation over her ‘motherhood’ last week, Charlotte (Tricia Helfer) seeks advice from Linda (Rachael Harris) in therapy – awkwardly, obviously. She then ignores it (duh! ), and goes to find Amenadiel who decides to reveal the whole story in its gore and glory, somewhat terrifying Charlotte. Later on, Lucifer determines that the only way to tidy up this mess is to confirm the story with the revelation of his wings to her – and so another is privy to the truth (and Truth?). Pierce (Tom Welling) and Chloe, meanwhile, are taking their first tentative steps into dating to the obvious displeasure of Lucifer, although he refutes it, even when in the comforting grasp of an Ella hug. And this is a hug taking on somewhat legendary status, with Maze requesting one when Ella visits – in order to steal her department ID and escape lock-up – before posing as her and offering one to a cop on duty in lieu of the rest of the official information she should have (and he is super-stoked at the prospect of receiving said hug). 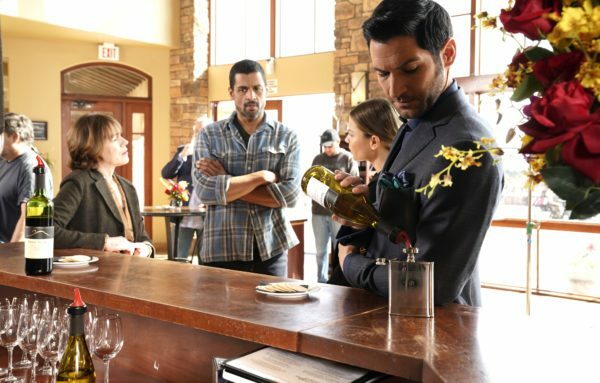 Lucifer, however, is obviously less than impressed by Pierce and Chloe’s workplace “canoodling”, and with Pierce’s previous boast of not risking his heart with Chloe but possibly getting the thing he most wants from her (mortality, we assume), it is difficult not to feel a little uneasy. This is also the case when he’s having a ‘bro’ chat with Dan (Kevin Alejandro) about Lucifer and Chloe’s close bond and Dan, who is no longer threatened by it, describes Lucifer as the cat that comes with some girlfriends and who you just have to learn to love. Pierce’s direct response is that he would simply get rid of it instead.